A pre-wired power center, makes this meticulously engineered, AC off-grid systems with grid tied options fast and easy to install. All components are assembled and tested by factory trained technicians to maximize ease of installation. We originally engineered this system for a large data collection site on I-80 in the Midwest. 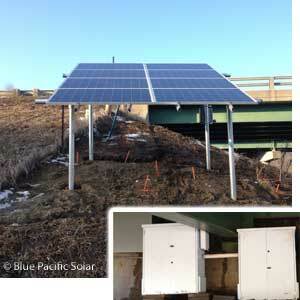 Our Solar Consultants said it would also be a good fit for some home backup power requests as well as off-grid homes. This kit starts with 8 250 watt solar panels and is expandable up to 18 panels without having to add a 2nd charge controller. We then added a 120 / 240 volt AC pre-wired power center with a 2nd battery box to house the charge controller and is expandable with an optional 3rd set of batteries giving you a whopping 28,800 watts of energy reserve. We packaged the whole kit with the charge controller in the 2nd battery enclosure so you can complete the wiring with a minimal amount of expertise needed. Your solution for cost effective off-grid power systems starts with a Magnum Energy pre-build power center and Midnite Solar charge controller. Magnum Energy and Midnite Solar have an in-depth understanding for off-grid solar systems. Our expert team of Energy Consultants have extensive experience expertise in designing custom-made stand alone systems for remote locations. Magnum Energy power centers are affordable, high-performance pure sine wave inverters and are considered the best on-the-market for off-grid solar. The Magnum MS4448PAE Power Center has sophisticated protection circuitry, making Magnum inverters immune from damage by overloads, short circuits, over-temperature and input polarity reversal. Midnite Solar charge controllers are a three-function controller that provides reliable solar battery charging. Midnite Solar circuit breaker box complete with breakers. 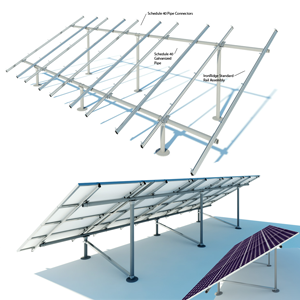 Optional IronRidge roof or ground mount rack options allow you the flexibility to put your system where it will best harvest energy on your property. 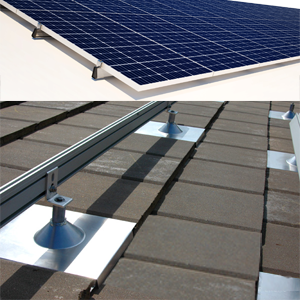 This expandable system has 25 year guaranteed UL listed solar panels, 5 year guarantee on Magnum powr center, UL listed combiner box and we supply all the connectors from the panel to the box. You supply the conduit and wire from the box to the power center which is outdoor NEMA 3 rated. The 19 kW Solar Generator is the only choice when you need a fully integrated off-grid system with pure sine wave inverter all pre-wired ready for you to add your own rack or select one of ours. Blue Pacific Solar will supply you with the 1 - Line Drawing; Full Instructive Three-Line Diagram of Entire DC Circuit, as Well as AC Lines to Your Main Panel. to hook it all up. You supply the brow sweat and save yourself thousands of dollars over the cost of hiring a contractor to install your system. Pre-built / wired power center with 2nd cabinet that holds charge controller, 8 additinoal batteries w/breaker box. Panels and connectors included. Choose optional ground or roof mount rack. Racks are not included in base kit package. 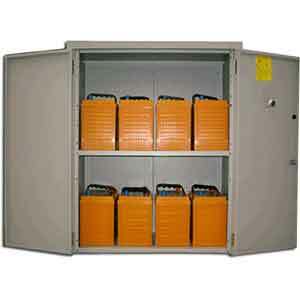 Both power centers are fully Assembled and tested by experienced factory trained technicians. Batteries are included, but are shipped uninstalled. Pre-wired and pre-tested for 120 / 240 VAC / 60Hz applications, Magnum MS4448PAE power systems have been specifically designed to combine all of the major components required for a high power home or off grid system. Magnum MS4448PAE power systems have all of the circuit breakers and controls right up front for convenience and easy code-compliance. Your Magnum MS4448PAE power system comes standard with the ME-RTR router controller. The controller has user friendly buttons and knob that gives you an easy to read menu system. You do not need an additional remote control unit to operate the power system, but if you want remote monitoring and control capability, an optional remote control can be located up to 150' away from the power center (50' cable included) to provide Magnum MS4448PAE power center monitoring and limited control at a more convenient location. 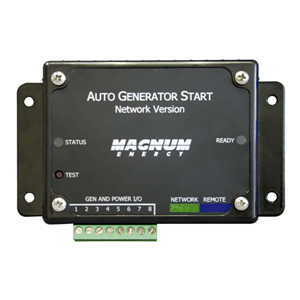 The Magnum ME-BMK battery monitor kit is included to supply easy to access information about your battery state of charge, voltage, real-time amps, etc. This is a quality built and certified power center that because it is installed in a Magnum panel extends the inverter warranty to 5 years. NOTE, IMPORTANT 2kW Solar Generator INSTALLATION: (OK, here is the scary legal disclaimer.) It is the responsibility of the purchaser to ensure that all products are installed and operated in accordance with local and national building codes as specific by the NEC (National Electric Code), UBC (Uniform Building Code) or IBC (International Building Code) and local utility company policy. These codes may vary from city to city and county to county. All off-grid solar installations should be permitted and inspected, where required, by the local inspection authority in the same manner as other equivalent electrical systems. One last thing. It is always a good idea to contract with a local licensed electrician to at least do the final electrical connection of your 5880 Watt Off Grid Solar Kit from the AC disconnect to your home utility breaker box. Some local permitting authorities require that a licensed electrician do all the wiring from the rack to the utility interconnect. 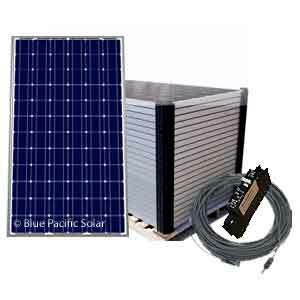 If you need help with the permitting documents for your 5880 Watt Off Grid Solar Kit package, we are here for you. Solar permit service add on is available at checkout.